009 Beta: can i do a manual install? First of all, please make sure you can see full file extensions in your operating system. set your resolution, tunngle IP, settings, volume and whatever else and save it. if all else fails, try starting generals.exe as admin and/or with DPI scaling off in its properties. Serious errors tend to be caused by bad configuration. ReleaseCrashInfo.txt in generals data dir will tell you more about the crash. "Description: The thread tried to read from or write to a virtual address for which it does not have the appropriate access." I did a manual install for my version of C&C from OS X's app store and it works great except for missing text. The solution for Contra 008 is extracting generals.csf from the ContraEN.big file and placing it in /Data/English/ however I don't have a working .big extractor for OS X, can someone with a Windows machine do me a favor? Did you rename !Contra009BetaEN.ctr to !Contra009BetaEN.big when installing manually? What language is your game? I have an idea for a possible solution. First, move !Contra009BetaEN.big out of your Zero Hour folder. Second, you must take the generals.csf and paste it inside the Data\*your game language* folder. Here's how the English language .big looks like. 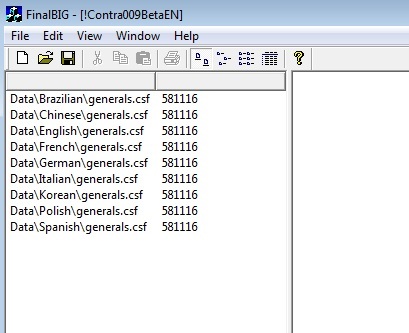 It contains directories for all Generals localizations. Edited by predator_bg, 18 December 2015 - 06:38 PM. I can only get a manual install working, because I couldn't get the launcher to work properly. While the launcher technically works, it kept saying it couldn't find the files.